Sadly, Hannah passed away in the winter of 2011. She is greatly missed. Mystique is our half-Andalusian mare who is a wonderful trail riding horse and a good steady horse for almost any rider as well. She is also the most beautiful one on the farm and knows it! She loves being groomed. 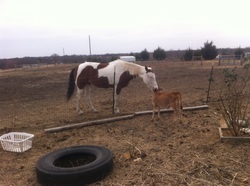 Mystique is currently a lazy girl in the pasture, having never returned to work after raising a beautiful filly! Boots is our newest fellow. 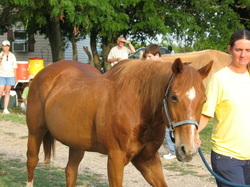 I finally broke down and got a gelding for the lesson program and he is a very well trained sweet Paint. He is the young guy on the block but has had mostly professional training and is very well broke. He was giving the cow some kisses in this picture! BEAUTY is a sweetheart of a pony. 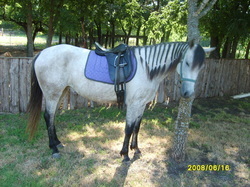 She is well loved as a pony ride girl in the petting zoos as well as being a dependable lesson pony for the smaller kids. 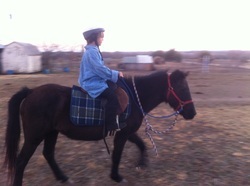 She's also currently in training to become a cart pony and doing very well in that current endeavor!